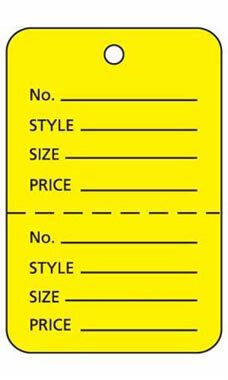 Keep track of your inventory and provide the customer with a recording of their purchase at the same time with our Large Yellow Unstrung Perforated Coupon Tags. Our merchandise tags are a great way to color coordinate or departmentalize your inventory for better record keeping. These tags are perforated through the middle for easy tear away and feature text to provide a stock number, style, size and price of the merchandise.